Here’s some fun facts about elephants: First, their ears are sort-of kind-of shaped like the continent of Africa. We don’t know if that’s intentional, since we still haven’t perfected our Elephant Speak (we’re working on it, though) and therefore can’t ask them about it, but it’s kind of like the whole Italy-shaped-like-a-boot thing…we think it’s so cool that we’re just gonna go ahead and not care how or why it happened. Second, the largest living land animals have to spend 16 to 18 hours a day eating. Which sounds like paradise to us, but can probably get to be a real drag when you wanna be doing other things, like running through the Bush or splashing around in jungle rivers. Also, for the record, these super cool mammals do not eat peanuts. It’s a myth! A really, really smart marketing myth (good on ya, Circus Peanuts) but a myth nonetheless. One thing that’s not a myth is the fact that elephants have incredible memories. They also play, cry, laugh, and love. In fact, elephants are such sensitive fellow animals that if a baby complains, the entire family will rumble and go over to touch and caress it. Which we think is pretty sweet, and it's also why we think this Toddler Elephant Costume is perfect for the sensitive, playful little cutie in your life! Made of 100% polyester velour fabric, this jumpsuit is soft to the touch, making your toddler even more huggable (if that's even possible). It's also totally adorable, featuring a stuffed trunk, attached tusks and ears, a tail with a faux fur tuft, and even felt "toenails" appliqued on the cuffs of the pants and sleeves! Super bonus? 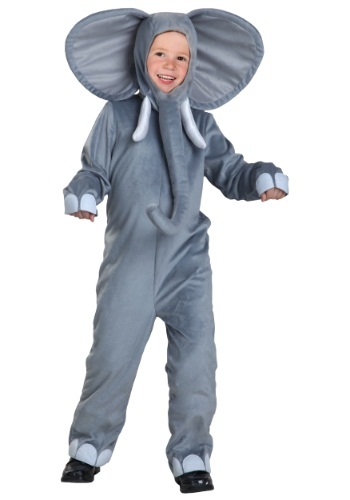 It comes in child, adult, and plus sizes, so you can create your very own "family" of elephants!